Most of my photos of this meal didn’t turn out but I still wanted to write about it because it was so nice. A friend of ours was staying and was off to Thailand the following day so I decided to cook some vaguely Thai style dishes. 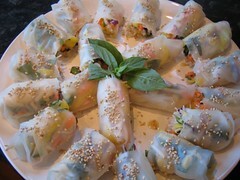 The picture shown is the mango summer rolls from VWAV. I make life easy for myself and buy a packet of beansprout stir fry from the supermarket so I don’t have to do much chopping. I make a nice spicy dipping sauce to go with them. I also did some jasmine rice, potato mussaman curry, mapo tofu and sesame fried pak choi. 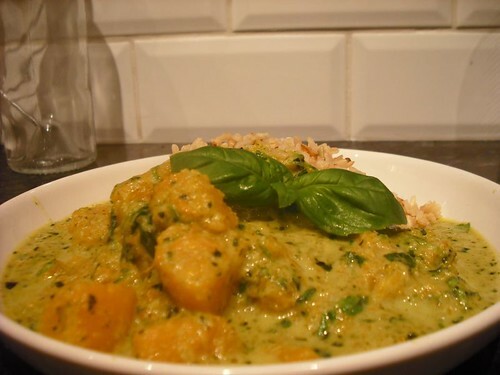 The curry recipe is from Nancy McDermott “Real Vegetarian Thai”. I made a big batch of the curry paste a while ago and froze it in tablespoon sizes so that was quite easy. Mussaman curry was our favourite dish in Thailand and this was a very nice version of it. For the mapo tofu I found loads of recipes on-line using firm tofu but when we’d had it in Thailand it was made with silken and I’d got some specially to try it. This recipe was one of the more simple ones I found but it was very tasty. I just stir fried the pak choi with some green chilli, a splash of tamari and some sesame seeds. Altogether it was a very nice meal and I’ll be doing more experimenting with Thai food from now on!